Solutions for Building Long Term Wealth. Here’s How! Continuing with the real estate investing strategies based on your financial goal, we are going to cover the “Wealth Builder” strategy. Of all your dreams, sending your child to a great college and having a comfortable retirement are two you won’t compromise on. The look on your child’s face as they cross the podium to receive their degree, just like the peace of mind that comes with a comfortable retirement, is priceless. Only nowadays “pricelessness” comes with a price. If your son or daughter is going to college years from now, the projected cost of an elite college from the years 2018 — 2021 could soar to a staggering $334,000 for a four year degree, according to Forbes. In fact, Washington Post reported, at least 57 U.S. colleges and universities come with a price tag of $60,000 a year and up… and the price is steadily ticking upward. What about having a retirement free from financial worry? That turns out to be another costly proposition. If you follow the “80% rule,” you should be saving 80% of your annual income, in order to properly fund it. That’s a lot of money! With the median household income for U.S. residents age 55-64 around $55K (Census Bureau), you would need to save roughly $44K for each retirement year — just to maintain your current lifestyle once retired. Here’s how you can get a head start. DOESN’T SOUND LIKE YOU? See Income Now or Wealth Protection strategies! Appreciation: As a physical commodity, real estate has historically increased in value over time. With this appreciation in value comes an increase in your net worth— and a greater net worth opens the door to new financial possibilities. 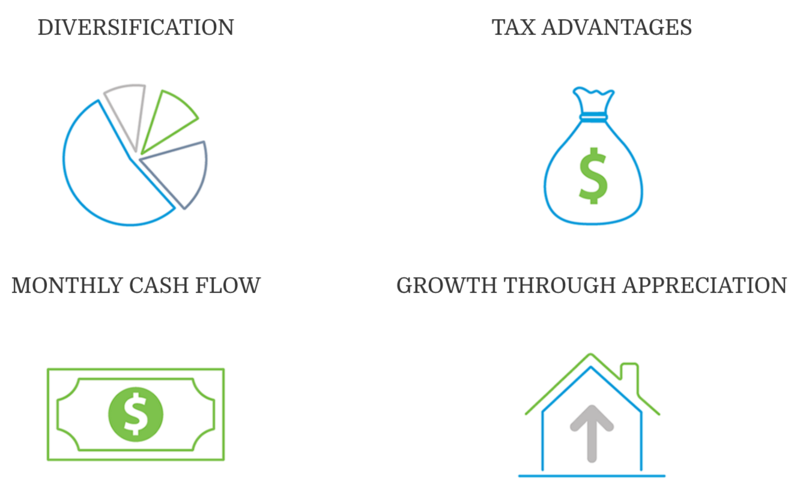 Cash Flow: When you own a single-family rental, you put more cash flow in your bank account every month from renters paying you rent. You can then re-invest this money or save to continue building your wealth. Re-invest: If you’re limited on your investment amount right now, start your portfolio with one property; as you grow your cash flow, re-invest in additional properties to increase your wealth. 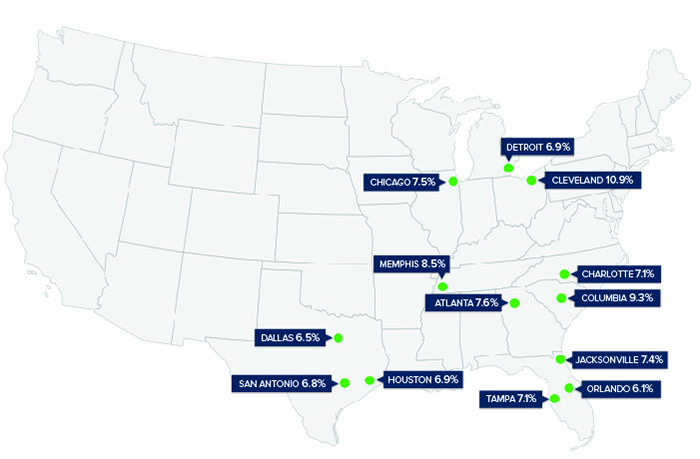 Today, investors are currently seeing solid cap rates across the nation. Take the example of Cory and Gioconda Sanders who were looking to build their wealth to retire in the next seven years. To secure their future for their family, they started investing in real estate. “We’re now proud owners of two single-family home rentals in emerging markets showing positive monthly cash flow and equity growth,” the couple state. Since you are concerned with your future, properties which offer long-term appreciation are more important than cash flow. 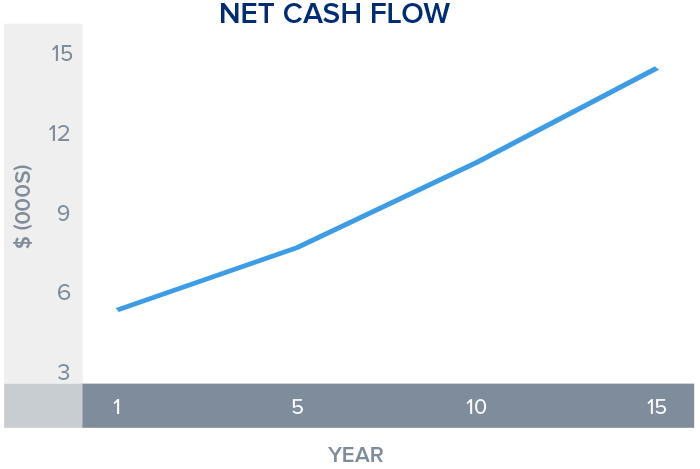 Generally, you want properties that are cash flow neutral to slightly positive. You will therefore want to look at properties in A neighborhoods, as these tend to appreciate at higher rates and carry less risk. Features of these neighborhoods include renowned school districts, closer proximity to amenities, and less vacancy. While investment properties can be funded in various ways, it makes the most sense to pay with either a 15 or 30-year loan. The reason is that your down payment will be lower and, as a result, your initial investment dollar will reach farther, enabling you to buy multiple properties. By buying multiple rental properties, you can potentially build wealth faster than you would by only buying a single rental. Just as beneficial is that after year 15 or 30, once the mortgage is paid off, all the cash your investment generates will go directly into your pocket. Since you will be investing in “A neighborhood” properties, you will be carrying less risk. If you also desire to increase your immediate cash flow, you can purchase properties in slightly higher-risk neighborhoods (i.e. B and C), as these that tend to have higher yields. 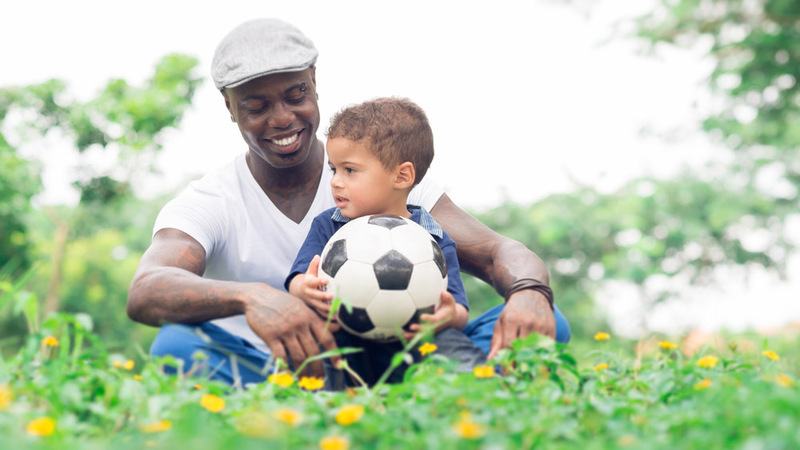 Following these steps will create a balanced, diverse portfolio whereby the properties in the A neighborhoods provide you with stability and appreciation, while those in B and C generate greater cash flow. This sample portfolio is comprised of four properties in A, B and C neighborhoods across the U.S. – Atlanta, Indianapolis, San Antonio, and Greenville. The result is a total monthly rent income of $5,180 and an average appreciation of 2.48%, with A and B neighborhoods having the highest appreciation values at 3.30% and 3.01%, respectively. With an initial investment of $201,966 on a 15-year loan, you get all four rental units— that are projected to generate $14,449 in cash by year 15. That’s a total return of 11.04%. By year 15, your wealth will have built up drastically. When you work with HomeUnion®, we build you a custom portfolio that will best help you achieve your financial goal of building wealth. Call us now at 888-276-0232 or schedule a consultation to start the process.